Char Dham, meaning ‘four abodes’, is the pilgrimage circuit around the four most revered pilgrimage sites in all India. These are in Badrinath, Dwarka, Puri and Rameshwaram, located at the four cardinal points of the Indian sub-continent. 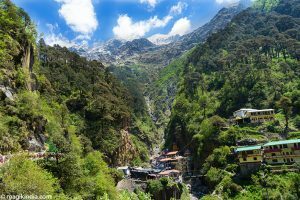 Hindus believe that a pilgrimage or yatra around the Char Dham cities opens the way to moksha, liberation from the cycle of deaths and rebirths. They also think that every believer should try to visit each of these places at least once in their life. Chota Char Dham: Over time, another Char Dham pilgrimage circuit has developed, in Uttarakhand state in North India. Its importance has increased considerably since the 1960s, with improvements in roads and other infrastructure. It is known as Chota Char Dham, ‘the four small abodes’ or ‘Himalayan Char Dham’ as all four “Dham” are situated in the Garhwal Himalayas. Most pilgrims start the ‘Chota Char Dham’ pilgrimage at Haridwar. Others set off from Rishikesh, or from Dehradun, capital of Uttarakhand. From there, the tradition is to visit Yamunotri, Gangotri, Kedarnath and Badrinath in that order ; from East to West. Yamunotri, 3300m up in the Garhwal Himalayas, marks the source of the Yamuna, one of seven India’s most holy rivers. Yamuna temple, on the left bank of the sacred river, was built by Pratap Shah, a 19th-century Maharaja of Tehri Garhwal. The idol is made of black marble. For Hindus the Yamuna, like the Ganges, has the status of a holy mother. Gangotri is a town near the source of the Ganges, more than 3000m above sea level in the Garhwal Himalayas. India’s holiest river is called Bhagirathi at its source and Ganga (Ganges) after it reaches Devprayag, where it is joined by the Alaknanda river. The actual source of the river is at Gaumukh on the Gangotri glacier, 18km from the town. 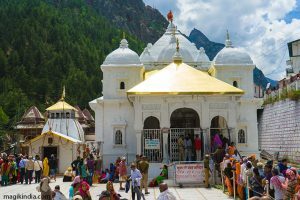 Gangotri temple was built by the Gurkha general Amar Singh Thapa in homage to Mother Ganges. Kedarnath is situated about 3583 meters above the sea level near the Chorabari Glacier. It is the abode of one of 12 Jyotirlingams dedicated to Lord Shiva. According to legend, the five Pandava brothers wanted to meet Shiva to ask him the absolution of their murders committed during the war against the Kauravas. Shiva decided to test them and went from town to town to finally arrive at Kedarnath in the form of a buffalo. Bhima, one of the Pandava brothers recognized him. Shiva decided then to sank into the ground, leaving only his hump on the surface. It is this hump that is worshiped in the temple of Kedarnath. Due to the extreme weather, the temple is open only late April until November. 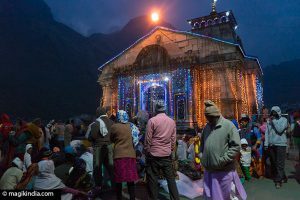 During the winter, the vigrahas (deities) of Kedarnath temple are transported to Ukhimath. The temple is not directly accessible by road. It is reached by a trek of 19km. Badrinath stands on the river Alaknanda, 3000m above sea level in the Garhwal Himalayas. According to the sacred Bhagavata Purana texts it is at Badrinath that Vishnu, in his incarnation as Narayana, performed a great penitence for the wellbeing of all living beings. 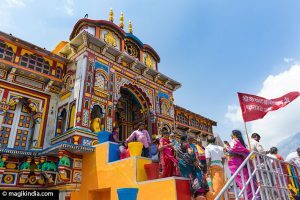 The town’s main attraction is Badrinath temple. Legend has it that the sage Adi Shankara found a figurine of the god Badrinarayan (Vishnu) made of holy black saligram stone in the river Alaknanda. It was kept in a cave near the Tapt Kund hot springs until the 16th century when the king of Garhwal had it moved to its current temple.